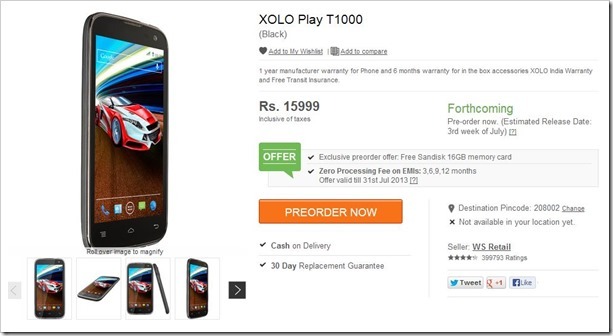 XOLO T1000, also known as XOLO Play is already on pre-order in Flipkart. Now, it has been revealed that the phone will be available from July 15th. The price of the phone is also revealed- Rs. 15,999. The T1000 is powered by Nvidia’s Tegra 3 quad-core processors which are essential a 4+1 system in which one extra core is a battery saver core. Whenever the phone is not actively being used, it will shift to that processor thereby saving a lot of juice (theoretically). Each core is running at a decent 1.5 GHz. Being an Nvidia processor, we have a 12-core Nvidia ULP GeForce graphics processor with 1 GB RAM and 4 GB internal memory. 4.7” HD (1280 x 720) screen with IPS display. 8 MP rear Camera (Full HD recording and LED Flash) and a 2 MP front facing camera. 2000 MAh battery with a claim of 11 hours of talktime. 3G / Wifi support and active noise cancellation. All phones that are being launched now have Jelly Bean though it would have been better if the phone came with the latest iteration (4.2.2) instead of the older one. As almost all the phones in this range have similar features, these small things make the actual market difference. Nvidia has from the beginning focused on games as its forte and this phone is no different. It boasts of several games optimized specifically to Tegra 3 and also gets support for Nvidia Tegra games through Nvidia TegraZone. It is in competition with newly launched Micromax Canvas 4 and Karbonn S9 Titanium. Both these phones are powered by Mediatek 1.2 Ghz quad core processor and so XOLO with Nvidia Tegra 3 is a much better choice. On the plus side though, they have a 5 inch screen and higher pixel cameras (But, for me those are not all that important). What is important is both these are more expensive, which makes XOLO T1000 a much better proposition. All in all, because of its lower price and specific appeal towards gamers and better processor, XOLO T1000 should be able to give Micromax and karbonn a run for their money. It is interesting to see that Indian companies are now sniffing “the above Rs. 15K range” now. They seem to be getting more confident that they can deal with the big players. Talk about a power-packed phone! Xolo is really stepping up its game and is ready to take on the biggest names in the mobile industry in India. 1.5 GHz NVIDIA Tegra Quad core processor and 12-core Geforce GPU rocessor bound together all in a great looking phone, Xolo Play is my next buy. Can’t wait. An Nvidia Tegra 3 powered phone, finally! And surprising that none of the well known and established mobile companies think of a gaming phone and Xolo, which is relatively new, is the first one to come up with this crazy and amazing phone. Well, it works in our favour, as Xolo really does give performance-oriented phones instead of overpricing standard phones like the big brands do. Xolo with Nvidia Tegra = must buy. Great specs. Gamers and non-gamers alike will be delighted by the amazing graphics Nvidia Tegra provides. Go for it!